We spend the day exploring the history and legend of King Edmund and the coming of the Danish micel here, 'Great Army', led by the Ragnarrson brothers, Ivarr, Ubbe, and Halfdan. Our primary source is that Old Testament of English history, The Anglo-Saxon Chronicle, where the entries concerning Edmund’s death on 20th November, 869, imply that he was probably killed in battle near Thetford. We shall assess these near-contemporary entries in relation to the huge quantity of later legendary material, especially Abbo’s Passio Sancti Edmundi and the stirring Old English version by Ælfric. 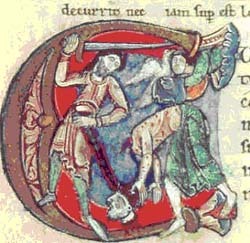 Sam Newton was awarded his Ph.D in 1991 and his first book, The Origins of Beowulf and the pre-Viking Kingdom of East Anglia, was published in 1993. He is a Director of Wuffing Education and Time Team historian and has been researching, lecturing, and writing as an independent scholar in Wuffing and Early Medieval Studies for many years. His latest book, The Reckoning of King Rædwald, was published in 2003.